I am Kit. I am the light colored one on the left. 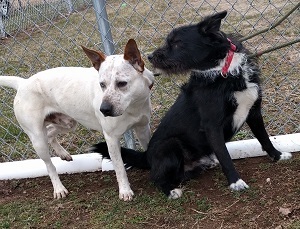 I am a heeler mix, about two years. I like to sit and play fetch. Pablo is lab schnauzer mix -black and about nine months old. Since he is my little brother he is a little more cautious making friends. We are both boys and will be getting our surgery soon. We love to be together, and hope that maybe we will be adopted together. We are housetrained. I hope to see you visit us soon. 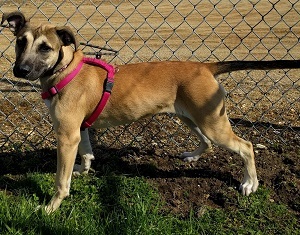 We are at the St. Joseph County Animal Control Shelter located at 652 E. Main St., Centreville, MI. Animal Control is open Monday – Friday, from 9:00 a.m. – 4:30 p.m. Their phone number is 269-467-6475. Please visit the Animal Rescue Fund website at www.arfund.org to see more adoptable pets. Also, to see more adoptable animals at SJC Animal Control, go to Facebook “stjosephcountymiac” or www.petfinder.com.